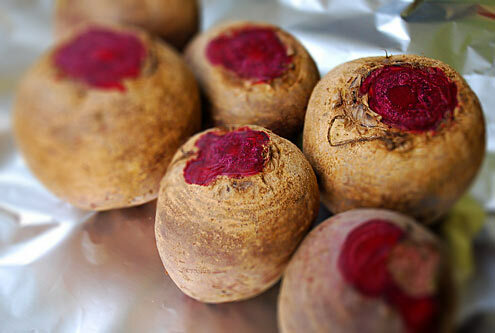 Top and tail the beetroot, wipe away any soil with a damp cloth and wrap up together in foil. Place on a baking sheet and roast in the oven for 2-3 hours or until tender when stabbed with a skewer. Peel when cool enough to handle and cut into thin slices. Pour the vinegar into a saucepan, add the peppercorns and salt and bring to a simmer. Layer the beetroot and shallots into a sterilised* (500 ml) jar and pour over the vinegar. When cool, add a pretty label. Delia’s Pickled Beetroot with Shallots will be ready to eat after 2 days. * Wash the jar(s) in warm soapy water, rinse and place in a moderate oven for 5 minutes. Verdict: The red wine vinegar gives this pickle a milder flavour than the shop-bought stuff. 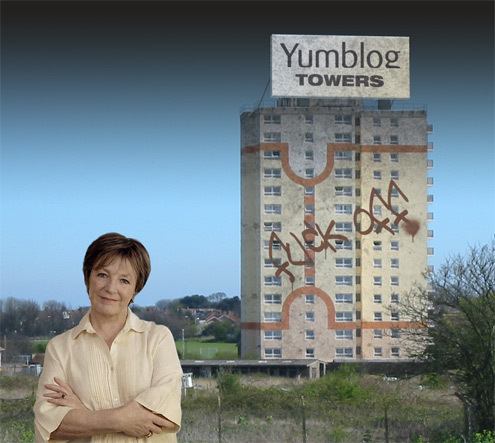 Very tasty indeed, Delia. Drink: K4e with UHT milk and (French) sugar lumps. Entertainment: Jon Holmes on 6Music. Two texts read out for Blogger-R, one for Blogger-D.
Look stop feeding my Delia fantasies will you. I didn’t realise you had fantasies about Delia … I had you down as more of a Fanny man. We here at Yumblog Plc take our responsibilities as a corporate citizen seriously and like to think of ourselves as more than just an employer. We aim to create an nurturing working environment in which everyone, irrespective of nationality, culture, ethnicity, class, creed, age or stupidity, can dare to dream to touch the stars and strive to reach their full career path potential. It is this attitude which year-on-year has enabled Yumblog Plc to consistently deliver leading-edge blue-sky solutions to our ever growing portfolio of clients. Yep, the beetroot needs to be completely covered by the pickling solution.